fields, POSTECH secures the research competitiveness for the 21st century. Strong 20 Project discovers and supports 20 main research groups with growth potential and foster them to become world-leading research groups with global competitiveness. POSTECH selects 20 groups by evaluating their competitiveness, academic excellence, commercialization possibility and multidisciplinary and allocate 2~3 extra professor positions besides the department's quota with financial support. With Strong 20 Project, POSTECH will secure global competitiveness, foster research culture through convergence and actively attract national and industrial big projects. With the number of SCI papers per faculty member reaching over 6.8 per year, the number of citations per paper exceeding 14.71 and the number of SCI Impact Factor per paper 4.71 in 2015, POSTECH’s research performance has been regarded as one of the best in Asia and has spurred the corresponding growth of the university’s intellectual properties in quantity. Now, POSTECH strives to significantly enhance the quality of our research by conducting high-risk, trend-setting research, publishing high-impact papers, securing core and enabling patents and developing a proactive entrepreneurial & technology commercialization ecosystem. POSTECH aspires to become one of the world’s best in selected research areas in science and engineering such as next-generation materials. Complemented by excellent research institutes and infrastructures that are second-to-none in Asia including the Pohang Accelerator Laboratory, the Max Plank Korea/POSTECH, the Asia Pacific Center for Theoretical Physics, the Graduate Institute of Ferrous Technology and the National Institute of Nanomaterials Technology, POSTECH seeks new breakthroughs in basic and applied research that can advance the world. POSTECH strives to conduct venturous and creative research in basic sciences. Four research centers of the Institute for Basic Science (IBS), which was recently established by the Korean government to promote world-class research in basic sciences, are located at POSTECH. Four outstanding scientists and their teams in the fields of mathematics, physics, chemistry and life sciences are currently carrying out world-class research on campus. POSTECH is also a leader and innovator in the field of engineering. A prime example of POSTECH’s commitment to collaborative and multidisciplinary engineering education and research is the Department of Creative IT Engineering (CiTE). By performing world-first high-impact research that takes advantage of Korea’s phenomenal strengths in IT and deploying a new educational paradigm that emphasizes self-initiation in problem-solving, collaboration and entrepreneurship, CiTE is laying a strong foundation for the future to advance IT companies’ innovative capacities to the next level, elevate their competitiveness and solidify their position as global leaders and innovators. With Pioneering and excellent research, POSTECH is leading the innovative technology development that the industry needs and also implementing a new academia-industry cooperation system in Korea based on a mutually-beneficial long-term partnership between the university and industry. 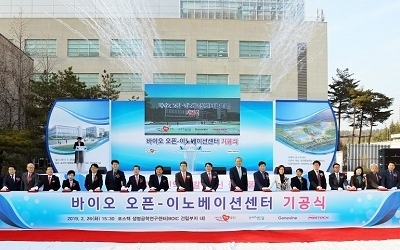 Also, by organizing the Association of POSTECH Grown Companies (APGC), which consists of over 50 venture companies founded by university members and alumni, POSTECH actively promotes the creation and growth of start-up ventures by supporting entrepreneurs with practical help such as entrepreneurship education/training, venture mentoring, angel funding and management consultation. To spread entrepreneurship to the members, POSTECH is providing programs and services that can produce new core patents and strategies such as Technology Trand Analysis and IP Portfolio. POSTECH also established Business Development Team to deal with technology transfer, patent registration, patent application and start-up. POSTECH is running its own special programs to promote research culture. ‘Let me introduce my research!’, which is one of the most prominent, is a program that any member of POSTECH(undergraduate, graduate, professor, staff, researcher) introduces his/her research or work for 3 minutes as easily as any non-majored audience can understand. Also there are Research sharing video relay(newly appinted professors explain thier research and expected collaborationable feilds for 1 minute), Research Group Meeting(consisted with researchers from more than 2 or 4 fields) and Research Idea Contest (discovers research ideas with unexpectable possibilities and high impacts). With these programs, POSTECH fosters reserach culture that researchers from different fields communicate and share ideas without boundaries.